The flavor of the Green Dragon Apple is really unique like no other apple I have ever had before. Juicy, crisp in texture, and sweet, the Dragon Apple tastes like an apple-pear-pineapple! Thinly slice your apples and toss gently in lemon juice. This will help the apples from turning brown. In a small bowl whisk together all of the ingredients for the vinaigrette - chill until ready to use. Arrange apple slices onto the bottom of a salad plate in a circular pattern. Then stack 3 to 4 butter lettuce leaves on top of the apples. 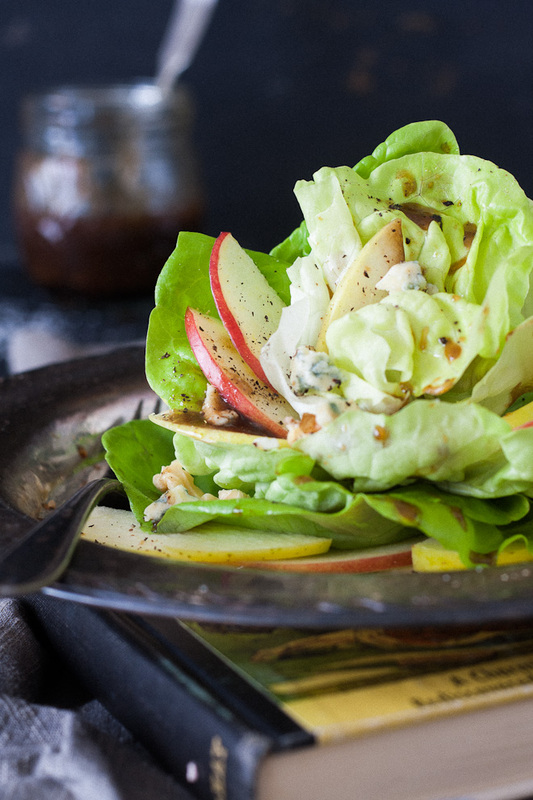 Tuck a few more apple slices in between the layers of lettuce and scatter walnuts and blue cheese over the top. Drizzle with vinaigrette and serve cold. You can also tear the head of lettuce into a salad bowl and toss with the walnuts, blue cheese, and vinaigrette to taste.